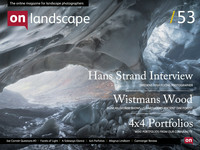 Landscape photographer from Sweden. Intrigued by nuances of light. Inspired by wild places. This month we're featuring a colleague of Hans Strand's - Magnus Lindbom. Sweden has some fantastic landscapes and we'd like to feature more photographers that are making the most of it. I've seen Magnus' work for some time and hope you enjoy his work as much as I do. I grew up close to nature. Spending summers sailing along the archipelago of the east coast of Sweden and winters in a cabin in the mountains going skiing with my parents. I have always been intrigued by the outdoors. I got interested in photography at the age of 18. The first digital compact cameras had become pretty good and I got one for a graduation present from my parents. Before that I had taken very few photographs myself, but had been interested in the visual arts in general. With the camera I explored the nearby landscape and brought it along on my first real hike in the mountains. After that trip I was hooked although I remember looking at the images afterwards and being utterly disappointed. That became the motivation to improve and venture out on this journey of learning landscape photography. In terms of photographic education, I’m self-taught. It’s been a long and hard way for me, but it’s the way that I learn the best. Here in Sweden we have this unwritten law that states that one should not talk good about oneself, but I guess it’s fine here since this is in foreign language. I must confess I’m proud to call myself a landscape photographer today. My hobby has grown into what is almost a profession. I say almost, as I’m not fully there yet, but hope to be soon. As I stated in the previous answer I’ve learnt everything the hard way, by myself. It’s been a lot of work but, of course, great fun as well. It’s the failures that make you better and I have had the fortune to have a lot of them. Today I feel confident when I head out with the camera. If I find something that grabs my interest I’m often able to translate it into a photograph. I let others judge if the image works or not, but it’s definately a good feeling and something I’m proud of as well. In most photographers' lives there are ’epiphanic’ moments where things become clear, or new directions are formed. What were your two main moments and how did they change your photography? I can’t think of two single moments. For me it has been the experience of a series of events over time. I had a period when I photographed almost completely in black and white. Then, when I started to do more colour work again, I became much more aware of the colours in the scene and how they worked together. As a result my colour photography shifted towards less colour but more consistent colour. I think this comes from the simplicity of a black and white photograph which I try to apply to my color images as well. To much colour can be a distraction. Nowadays I try to let the scene and conditions dictate in what direction to go, colour or black and white. The second series of events that have changed my photography has been over the last two years or so. I have challenged myself to photograph in the kind of light conditions that I haven’t worked in before and it has been very rewarding for me. It’s easy to get into a way of doing landscape photography that follows a formula and then repeat that formula over and over again. As you do this you miss a lot of other opportunities. One example is this image (Grey, Öja) from November last year. As the title of the image suggests this was a really overcast and dull morning. Would this have been five years ago I wouldn’t even have bothered to get out with the camera, but now instead I was totally inspired by the conditions. The fascinating thing was that even on this overcast morning there was some direction to the light which rendered the shape of the rocks in a pleasing way. There are discoveries like these that makes landscape photography so fascinating. Tell me about why you love landscape photography? Landscape photography combines the two things I enjoy the most in life, being outdoors and being creative. My photography is all about the landscape and has been from day one. There is something special about it, wandering around with the camera in nature. It really slows you down and opens up all of your senses. It’s a fantastic thing. I’m also fascinated by the power of a single photograph. It can communicate so much in an instant. I use a Canon 5D Mark II and the tilt-shift lenses; 17 mm, 24 mm, 45 mm and 90 mm. The ones I use the most are the 24 mm for larger landscapes as well as details and the 90 mm for details. Both are stunning lenses. The reason I invested in this kit three years ago was to be able to use the shift to stitch and create images in different aspect ratios without having to crop and lose pixels. I use this technique a lot. Because I don’t see the final image when I’m photographing I have to be very focused on how I compose the scene. I can’t just pick up the camera and point around to find something, I have to work out the image before I put the camera on the tripod. I have to have an idea, a concept and a composition. In the beginning this was really hard but after doing it for a few years I have become much better in finding compositions and much more aware of everything in the frame. For me processing is important. I use a combination of Lightroom and Photoshop. I start in Lightroom with some basic adjustments to the raw-file, usually it’s about fine tuning white balance, general tone, crop and sharpening. The highlight and shadow recovery in Lightroom is impressive and something I use a lot. I then open up the image in Photoshop and use a variety of adjustment layers and masks to enhance the different areas of the photograph. I find that Photoshop is superior to Lightroom when it comes to local adjustments. Some images looks really good straight out of the camera and some images need more work to get to the result I had in mind when I made the image. I rarely use grad filters so sometimes I have to blend exposures for dynamic range as well. I like to do a rough edit, print it and come back to it after a few days with fresh eyes. It’s easy to get lost in all the possibilites so I find this to be a good approach. When I use the shift-stitch technique, as I do on most of my images, I need to merge two or three images in Photoshop just to see the final image and be able to evaluate it in terms of composition etc. In this case I often merge the images first without any adjustments and then pick a favorite from a shoot that I continue to work on. I do. I print all of my images myself on a Epson 3800. I have explored a vast number of different papers and found the Canson Photographique Baryta to be the best choice for me. It’s a really good feeling to get the images on paper, specially these days when most is digital. When I first started printing I was fascinated by the uncoated art papers but the greater range of tones and colors and the better rendition of details that the coated baryta papers offers won me over. However I do have some ideas of projects that will be on some kind of matte paper. I was shown a japenese rice paper by a friend lately and it looked very interesting. I will have that particular paper in mind when I’m out shooting in the future. It’s interesting how the printing process can feed ideas into the field work. One of the first books I read on the subject of landscape photography was Galen Rowell’s “Mountain Light”. The images in the book are beautiful but it was the stories and insights that resonated most with me. Galen’s passion for the outdoors really comes through when reading the book. Nowadays I find inspiration in the works of many photographers and I’m constantly finding new ones on the web (On Landscape has introduced me to excellent photographers I have never heard of before). A few photographers that I admire and get inspiration from currently are Jan Töve, Paul Wakefield and Charles Cramer. Regarding your workshops, how is that going and do you get mostly Swedish participants? I have been teaching workshops for the last five years and it is something that I enjoy a lot. It is also a good source of income for me. The workshops has been very popular and I’m constantly trying to come up with new concepts as I develop as a photographer. I have also started to lead photo tours in small groups. So far they have been to Lofoten and this fall I will do another tour to northern Norway, even further north acutally to the Varanger peninsula. I love doing these tours with small groups, it’s a really rewarding experience for me and, hopefully, the participants feel the same. What is the landscape photography scene like in Sweden? i.e. do people buy prints/run galleries? Are there many landscape photographers? Is honeypotitis as virulent as in the UK? I believe there is a fundamental difference between Sweden and the UK (or the states). In Sweden the category “landscape photography” isn’t well known, instead it is included in the wider more commonly known category “nature photography”. Even if you do only landscapes you get placed in this category. I think this has to do with the history that we have here in Sweden; a nature photographer photographs everything of the natural world with main focus to document and not to create art. So if you are a landscape photographer who wants to create work of art it’s a little harder because of the history we have. With that being said, I do see things changing. The interest of landscape photography is high (even if it’s not called that). There are a few that are able to make a profession out of landscape photography but the majority are skilled “amateurs” that enjoy it as a hobby. There are very few, if any, landscape photographers here in Sweden that run their own gallery. I think it’s because of the small market. It’s not as common for people to buy photographic prints for the wall here as I believe it is in the UK (correct me if I’m wrong). However, I don’t think it’s impossible to run a gallery and it is something that I will look into for the future. It is every landscape photographers dream, right?! In terms of photographic icons we don’t have as many of them in Sweden as I think you do have in the UK. Of course there are popular spots which are easy to get to. Two examples are Söderåsens National Park in the south and Abisko National Park in the north. We don’t have many obvious landmarks and I guess it helps preventing the “icon hunt”. When I hike in northern Sweden I can find wonderful places which I haven’t even seen before in a photograph. It’s hard to pick favourite images as they change from day to day. For the moment, however, I really like these three. This was one of those mornings you don’t get very often. The image is made in an area called Trollforsen which is a beautiful area of rapids in Lapland in northern Sweden. I had scouted this spot along the river the evening before and walked there in the dark early the following morning with the hope to catch the first light. When I got to the spot it was still dark but I was pleased to see that there were some fog on the other side of the river. As the sunrise approached there was this beautiful glow of red in the sky. What I really love about this image is the background with all its details and the depth that the fog creates. It’s an image that I’m very pleased with. I made this image during a trek in Sarek National Park in the north of Sweden. The hard to pronounce title of the image, Smájllájåhkå, is the Sami name of this glaical river. It was a quite challenging image to make. The weather this morning was contstantly changing with sun and rain at the same time, which is perfect conditions for mountain photography. I remember cursing the weather everytime I had to wipe off rain from the front of the lens. I worked with this scene for almost two hours waiting for the light to play the way that I wanted, and finally it did. I think that is how I usually work. When I find a scene with potential I try to really work it through to make the best image that I can before I continue. I feel like I have to choose a more intimate image as well. Maybe not my favorite image of all time but I love the concept of making images of something that might not be of interest to most people and present it in a way that is both beautiful and interesting. Coming down on this beach in Lofoten I was immediately intrigued by a part with a nice mix of washed up kelp, snow and sand. It was one of those images which required very little work in terms of finding the right composition. I just reacted instantly, got the camera in the right position, made a few exposures and then moved on. Actually I don’t have a problem with taking a week, or even more, off from photography. Sometimes I go quite some time without making any photographs at all. Coming home from a long and intense trip often requires me to take some time off to find inspiration again. I enjoy being outdoors without the camera as well (it’s a great way to get inspired) and in the winter I do some cross-country skiing. If I had more than a week I would get the backpack ready and get out on the trails and the good thing would be I would carry much less as I don’t carry the camera gear. I also have a passion for music and food. Both in worringly large quantities. I will continue to explore different kinds of light. I’m much more aware of the nuances of light today than I was a few years ago. I love to work in the “quiet light” which often helps to simplify the image, but also it’s more challenging than that bold, fiery sunset. When the light isn’t the main character of the image the composition has to be stronger and that is a challenge. I think all landscape photographers have experienced the feeling of having great light without really having an idea of what to make an image of except for that light. It’s kind of a relief to work in light that is more constant and to be able to work with an image for a longer time. Lately I have also been experimenting with shallow depth of field, something which I have never really done before. I feel like there are a lot of possibilities for landscape images in this way that I might have missed, as most of my images are done with the ambition to have focus everywhere. The future will tell. Also, I have always loved black and white but most of my recent images have been in color so that is something for the future as well. I think you should feauture Bård Løken, a Norwegian photographer whose work I really admire.